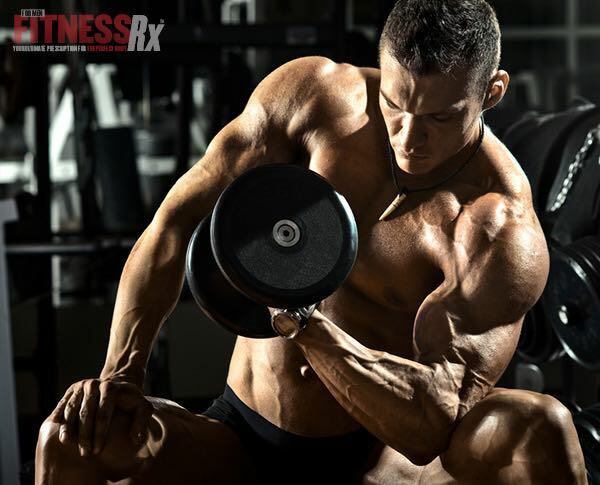 FitnessRX for Men > Training > Workout Tips > The Best Training Tips Ever > Are Full-Body Workouts Best to Build Muscle and Strength? Arnold Schwarzenegger and other well-known bodybuilders were known to perform 30-40 sets per body part. The split system was the exact opposite of the Arthur Jones training system, which advocated High-Intensity Training, acronym HIT. • A full-body workout recruits more motor units or muscle groups per workout than split training. • Full-body workouts elicit greater increase in testosterone and GH than split routines. • Each body part is trained more often and yields a greater anabolic effect. • A body part is usually recovered within 48 hours; therefore, not training that muscle again within 48 hours is wasted time off. • Protein synthesis rates for muscles can be increased for 48 hours after a muscle is trained and then starts to drop. Traditionally, I have trained one body part per week; however, a training partner and I decided to try the old-school training and try the whole-body, three-day training routine. After a few weeks, the pounds started dropping while my training partner’s lifts kept going up. We were doing the exact same routine; he was getting stronger and I was overtraining. What the hell was going on? It made me realize how different our genetic recovery capacity was; additionally, he is 10 years younger than me. Another example of superb recovery capacity was an interview with “World’s Strongest Man” competitior Mariusz Pudzianowski; he does two workouts a day, one is strongman training and one is in the weight room. His workouts consist of back squats one day, deadlifts the next day and front squats the next day. He trains his shoulders by doing behind-the-neck jerks, where he works on speed and explosiveness, three times a week. He starts with push jerks, working up to 405 for a very easy and fast 2 reps. He then squats high bar, Olympic style, up to 2 easy, quick sets of 585 for 3 reps.
Guys who have trained with Mariusz say that his work capacity and recovery ability are totally out of this world. They also commented that most strongmen would not be able to train in this fashion without overtraining. Each person recuperates at different rates from workouts. Some people are blessed with great genetic potential for recovery, while others need longer. It was recently reported that testosterone suppressed the activation of a major catabolic protein called Muscle Atrophy Factor.5 Many beginning weightlifters think that there is a “secret” training routine that mega-huge musclemen are using. Take a look at one study showing how testosterone levels dictated levels of muscle regeneration and repair. A preliminary study examined the effect of two doses of nandrolone deconoate (2mg/kg and 6mg/kg) on regeneration and satellite cells in mouse skeletal muscles following intense muscle damage. The mice using 6mg/kg experienced enhanced muscle regeneration; however, regeneration was not improved in injured muscles of mice treated with a lower dose of 2mg/kg nandrolone deconoate. Thus, the higher dose (6mg/kg) of the anabolic steroid was required in mice in order to produce a beneficial effect on muscle regeneration after severe muscle damage.8 The study suggests that greater testosterone enhances muscle recuperation. Just because a humongous bodybuilder trains each body part twice a week does not mean you can train this way. Your ability to train depends on a number of factors. I often wondered why some people such as powerlifters can train one body part a week and be massive. Two guys might be considered “mass monsters” while their training routines are completely different. One guy trains each body part twice a week, while another guy trains each body part once a week. Each man, probably through trial and error, found a system that worked for his genetics. A recent study released in the Journal of Physiology helped me understand what happens to muscle growth factors after one intense bout of exercise, and more importantly what happens to the growth factors in the recovery period. IGF-1 is a growth factor found in circulation (produced in the liver) and locally in muscle. The researchers looked at the three isoforms produced in muscle (IGF-1, IGF-1Ea, IGF-1Eb and MGF) to determine whether each may contribute in some extent to muscle regeneration. IGF-1Eb may be involved in hypertrophy or muscle regeneration; however, the physiological role of IGF-1Eb in human skeletal muscle is currently unknown. MGF is a splice variant of IGF-1Ea that stimulates satellite cell activation and muscle hypertrophy following muscle stretch or muscle damage.10 The study had young subjects (average age 20) perform 30 sets of 10 maximal eccentric contractions with 1-minute rest periods. Bring the pain! Muscle biopsies were taken both immediately before and after exercise. The study found that MGF expression (a potent muscle growth stimulator) peaked at 24 hours, but then IGF-1 isoforms were still elevated after muscle damage, suggesting muscle repair was still occurring. Another interesting point was that after intense muscle damage, MGF was activated while serum IGF-1 levels showed no change! Additionally, the Journal of Hormone and Metabolic Research reported that strength training was increased after 12 weeks, despite unchanged levels of serum IGF-1 in men.13 It seems that peripheral changes in IGF-1 may not be as important for muscle growth as once thought… getting back to recuperation. The point to think about is that if you tried to retrain legs after an exercise protocol 48 hours after exercise, you would still be in the recuperation phase and start overtraining. Your training frequency depends on your recuperation! The more muscle damage you create during exercise, the more recovery time will be needed before you can train again. In the study mentioned earlier, after intense eccentric exercise, muscle recovery was still not complete after three days. It’s notable that most of the studies suggest that with eccentric exercise and muscle damage, muscle growth factors are expressed shortly thereafter. Training frequency is also dependent on the level of nervous system fatigue that is induced during each training session. If you do not tire out the nervous system, you can obviously train more often. I imagine that if you perform 1 set of exercise as Jones recommended, you could probably train again 48 hours later, but is one set capable of stimulating muscle growth? The research clearly states that satellite cells are activated in response to muscle damage and multiple sets clearly induce more muscle damage and satellite cell activation. Based on the research, multiple sets are superior to single sets for stimulating muscle growth. Yet, one of the most recent reviews (published in the Journal of Strength and Conditioning Research) concludes that multiple sets work better.12 The data shows that single- and multiple-set programs produce similar results during shorter studies using untrained individuals. However, trained subjects using multiple- rather than single-set programs gain strength faster. Larger muscle groups also tend to recover more slowly than smaller muscle groups. For example, the smaller arm muscles (i.e., biceps and triceps) can be trained more frequently (two to three times per week), while the larger muscles in the legs take longer to recover and will respond better to one to two workouts per week. So, what frequency do I recommend? Well, I have no definite answer because this all depends on your training age, exercise volume, nutrition, anabolic use, supplements and sleep. It is well-known that muscle with type I fibers such as calves and the abdominals can be trained nearly every day, whereas type IIb muscle fibers in the legs need longer recovery times. Older athletes do not recover as quickly from exercise as younger athletes, so they may opt for a once-a-week training system, whereas a younger 18-year-old can train each body part twice a week. I think whole-body training sessions are great for athletes, not serious weight trainers who want to get huge. Football players often train this way during the season with great success, but this is for athletic purposes, not building muscle. If ‘whole body part’ sessions did work and are so great, then why aren’t professional bodybuilders using them? I think a complete body workout may be good for a beginner or competitive athlete looking to maintain strength during the season, but not for putting on muscle. Dedicated gym rats must perform some trial and error to determine whether once or twice a week is beneficial. • Training frequency is recovery-dependent. • Testosterone accelerates muscle repair and turns off catabolic genes. • After intense muscle damage, MGF is activated, while serum IGF-1 levels showed no change! 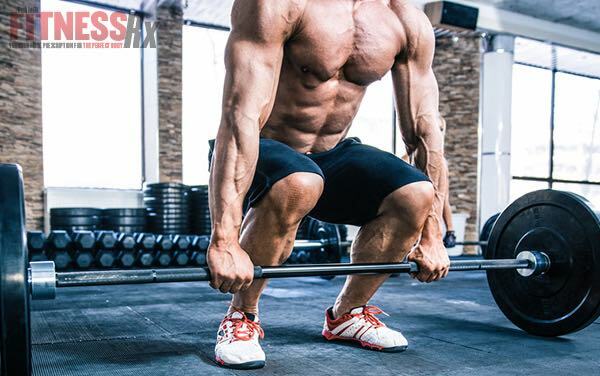 • Type I fibers such as calves and arms can be trained more frequently than type II explosive fibers (legs). Ferrando AA, Sheffield-Moore M, Yeckel CW, Gilkison C, Jiang J, Achacosa A, Lieberman SA, Tipton K, Wolfe RR, Urban RJ 2002 Testosterone administration to older men improves muscle function: molecular and physiological mechanisms. Am J Physiol Endocrinol Metab, 282:E601-E607. Urban RJ, Bodenburg YH, Gilkison C, Foxworth J, Coggan AR, Wolfe RR, Ferrando A 1995 Testosterone administration to elderly men increases skeletal muscle strength and protein synthesis. Am J Physiol, 269:E820-E826. Reid IR, Wattie DJ, Evans MC, Stapleton JP 1996 Testosterone therapy in glucocorticoid-treated men. Arch Intern Med, 156:1173-1177. Crawford BA, Liu PY, Kean MT, Bleasel JF, Handelsman DJ 2003 Randomized placebo-controlled trial of androgen effects on muscle and bone in men requiring long-term systemic glucocorticoid treatment. J Clin Endocrinol Metab, 88:3167-3176. Ferrando AA, Sheffield-Moore M, Wolf SE, Herndon DN, Wolfe RR 2001 Testosterone administration in severe burns ameliorates muscle catabolism. Crit Care Med, 29:1936-1942. Zhao W, Pan J, Wang X, Wu Y, Bauman WA, Cardozo CP. Expression of the muscle atrophy factor muscle atrophy F-box is suppressed by testosterone. Endocrinology, 2008 Nov;149(11):5449-60. Lynch GS, Schertzer JD, Ryall JG. Anabolic agents for improving muscle regeneration and function after injury. Clin Exp Pharmacol Physiol, 2008 Jul;35(7):852-8. Review. Souza R, Goncalves W, Dal Pai-Silva M, Gallacci M. Influence of anabolic steroid treatment upon muscle regeneration and satellite cells of mice following envenoming by Bothrops jararacussu snake venom. Toxicol Lett, 2007; 172: S237. McKay BR, O’Reilly CE, Phillips SM, Tarnopolsky MA, Parise G. Co-expression of IGF-1 family members with myogenic regulatory factors following acute damaging muscle lengthening contractions in humans. J Physiol, 2008. Hill M & Goldspink G (2003). Expression and splicing of the insulin-like growth factor gene in rodent muscle is associated with muscle satellite (stem) cell activation following local tissue damage. J Physiol, 549, 409-418. Linnamo V, Bottas R, Komi PV. Force and EMG power spectrum during and after eccentric and concentric fatigue. J Electromyogr Kinesiol, 2000 Oct;10(5):293-300. Wolfe, B.L., LeMura, L.M., & Cole, P.J. (2004). Quantitative analysis of single- vs. multiple-set programs in resistance training. Journal of Strength and Conditioning Research, 18, 35-47. Schiffer T, Schulte S, Hollmann W, Bloch W, Strüder HK. Effects of Strength and Endurance Training on Brain-derived Neurotrophic Factor and Insulin-like Growth Factor 1 in Humans. Horm Metab Res, 2008 Oct 29.